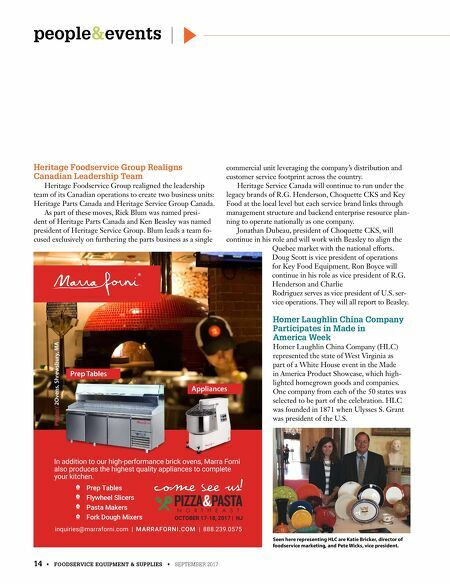 14 • FOODSERVICE EQUIPMENT & SUPPLIES • SEPTEMBER 2017 people & events Heritage Foodservice Group Realigns Canadian Leadership Team Heritage Foodservice Group realigned the leadership team of its Canadian operations to create two business units: Heritage Parts Canada and Heritage Service Group Canada. As part of these moves, Rick Blum was named presi- dent of Heritage Parts Canada and Ken Beasley was named president of Heritage Service Group. Blum leads a team fo- cused exclusively on furthering the parts business as a single commercial unit leveraging the company's distribution and customer service footprint across the country. Heritage Service Canada will continue to run under the legacy brands of R.G. Henderson, Choquette CKS and Key Food at the local level but each service brand links through management structure and backend enterprise resource plan- ning to operate nationally as one company. Jonathan Dubeau, president of Choquette CKS, will continue in his role and will work with Beasley to align the Quebec market with the national efforts. 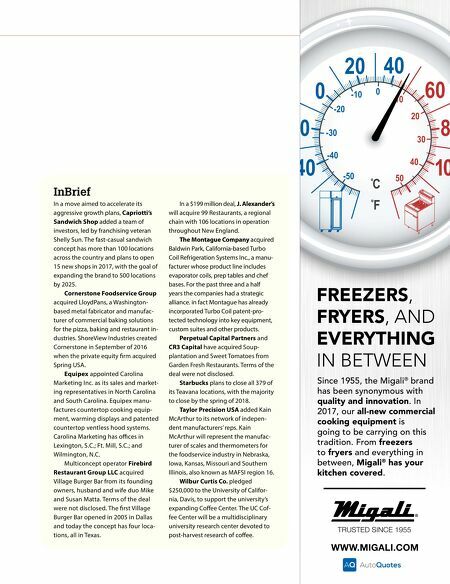 Doug Scott is vice president of operations for Key Food Equipment. Ron Boyce will continue in his role as vice president of R.G. Henderson and Charlie Rodriguez serves as vice president of U.S. ser- vice operations. They will all report to Beasley. inquiries@marraforni.com | M AR R A F O R N I . C O M | 888.239.0575 Photo// 2Ovens, Shrewsbury, MA Appliances Prep Tables Prep Tables Flywheel Slicers Pasta Makers Fork Dough Mixers In addition to our high-performance brick ovens, Marra Forni also produces the highest quality appliances to complete your kitchen. OCTOBER 17-18, 2017 | NJ Come See Us! Homer Laughlin China Company Participates in Made in America Week Seen here representing HLC are Katie Bricker, director of foodservice marketing, and Pete Wicks, vice president. Homer Laughlin China Company (HLC) represented the state of West Virginia as part of a White House event in the Made in America Product Showcase, which high- lighted homegrown goods and companies. One company from each of the 50 states was selected to be part of the celebration. HLC was founded in 1871 when Ulysses S. Grant was president of the U.S.